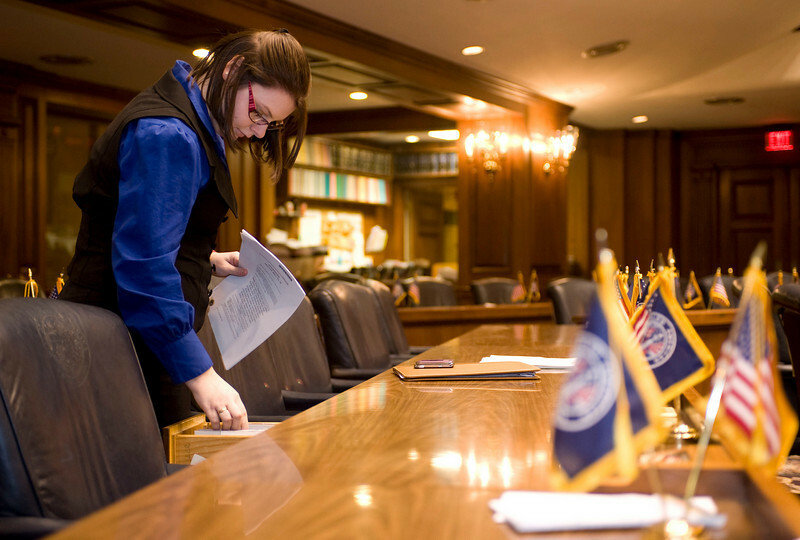 In busy legislative session, ISU students are "lifesavers"
INDIANAPOLIS - As members of the Indiana General Assembly wrestle with the state budget and other issues, they rely on a special group of young people to help them stay abreast of paperwork, phone calls and other tasks. "The interns here are the lifesavers of the legislators, " said state Rep. Mary Ann Sullivan. For some offices, it is an Indiana State University student tossing the lifeline. 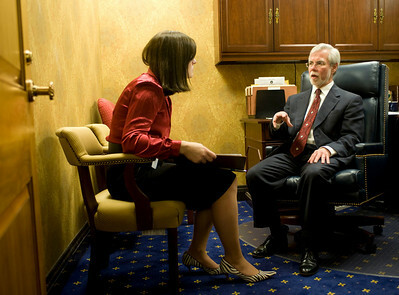 "I go through their e-mail and respond to constituents, draft letters, do surveys and help them prepare for sessions," said Abigail Miller, a sophomore political science major from Danville, Ill., and a legislative intern assigned to Reps. Sullivan, Greg Porter and Cherrish Pryor, all of Indianapolis. But there's much more to being a legislative intern than mere paperwork and running errands. "This is not a coffee and donuts internship. I'm researching past legislation about child advocates. Last week, I was writing speeches about renewable energy," said Kacey Smith, a sophomore legal studies major from Terre Haute assigned to state Sen. Tim Lanane, assistant minority leader. Given the limited number of full-time staff members available to lawmakers, Sullivan said legislative interns play an important role. "Interns are able to do all of those last minute things, special projects regular legislative assistants are not able to get to, maybe a research project," Sullivan said. Internships such as those filled by Miller, Smith and other students also help develop future leaders. "After I graduate from ISU, I really want to go to law school. Working directly with how law is made and how it's written and seeing it first hand in action here at the Statehouse, it really develops an experience that you can't gain in a classroom or anywhere else on our university campus. The internship and the networking and the doors that it opens up, you just can't get that elsewhere," said Smith. "I've always thought about running for office some day, so I just wanted to kind of see how the legislature works and the 'behind the scenes' politics," said Miller. "They have families. They're normal people and they're just like us. Our legislators work very hard," Smith said. "They do a very good job in what they do and they fight for what they truly believe in and I think if the public could see what I see then they would have a very different opinion," said Miller. Lawmakers also issued a good report card on their interns. "I don't want her to leave," Sullivan said of Miller. "That's the only bad part of an internship is that it has to end." A parent of three grown children, Sullivan describes herself as a political "late bloomer." She is pleased to see young women interested in pursuing a career in public service. "There is a much different attitude now than when I was growing up. There's a lot more encouragement for young women. It's wonderful that so many people are looking into getting into leadership earlier on," she said. As members of the Indiana General Assembly wrestle with the state budget and other issues, they rely on a special group of young people to help them stay abreast of paperwork, phone calls and other tasks. 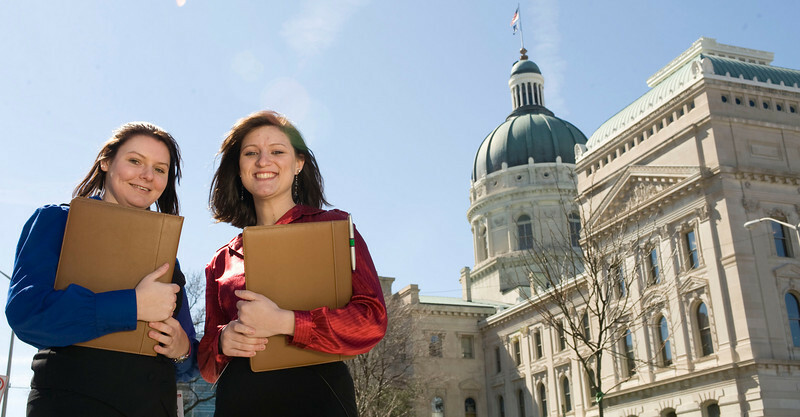 Lawmakers say Statehouse interns, many from Indiana State University are "lifesavers."